*please note; once you have ordered your service please EMAIL us HERE to ensure your booked appointment is where you need it to be as we are a by appointment only facility. * Wellness Works Within Mainframe = where we help other Wellness Workers gain an online presence by helping them develop their own pg. Every link in this post will bring you to a different element and or service. Who are we offering treatments to? In the past 5 years we have come to learn and realize that the majority of ppl who come to us are Women, Therefore we have decided to SPECIALIZE in this venue. You have to go with what area you are best suited & This is where i am being called to do work. 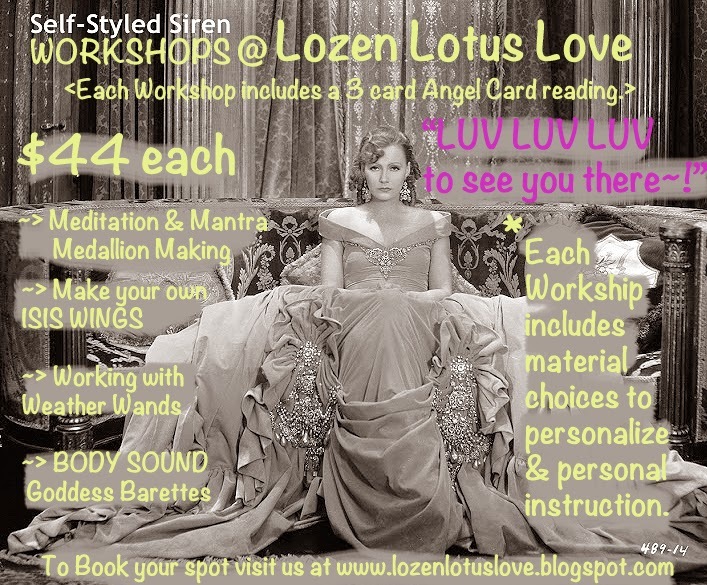 Women, are from now on THE FOCUS at LOZEN LOTUS LOVE. REFERENCES TO GIVE to help you find EXACTLY WHAT YOU NEED. After all, there is a 1000 different types of Healers for a million kinds of ppl. ONLY PRE BOOKED APPOINTMENTS ARE ELIGIBLE FOR TREATMENT AS THIS IS A PRIVATE CLINIC. Why Do Chakras need clearing~ article found in Om Times Magazine online~!!! The reason that the clearing of the chakras can affect so many aspects of life is that the chakra system is in coordinating and functioning control of the entire personal energy system. If the chakra system is brought into balance so does everything else in one’s experience become more balanced and grounded. There is improved self-confidence, peacefulness and a feeling of enjoying great control over the events of one’s life. A person’s chakras are attached to and dependent upon a central column. That central column needs to be cleared so that it is able to fulfill its role as a channel allowing free interchange of the various energies. After a thorough clearing of the column each individual chakra in turn can be cleared and reenergized to vibrate and revolve at the correct speed. In this way the coordination of the whole system is engaged and optimized. In other words, each chakra begins to operate in the way it was originally intended thus joining with and energizing the system as a whole. Positive changes begin and are immediately recognizable. What i love about what Rev L.C. is sharing here as she goes on to describe methods she does it and how long it generally will take is her straight forward easy to understand explanation. So we can start to see with such an eloquent description the value of having Tuning, Colour Therapy, Crystal Therapy, Reiki, Qi Gong, and even working with the Chakras via Acupuncture in Traditional Chinese Medicine. All Vibrational Healing methods that you will find a variety of ppl fulfilling in their roles as Wellness Workers. I also like to employ speaking with my ancestors, or the ancients when i am processing spiritually with my Chakras, in my treatment with others they also find it helpful to speaking with them and helping to feel divination guidance. Helps nurture a furthering of renewing our Chakras, our Qi, our Essence. Which in turn gifts us with VITALITY and we find all sorts of positivity flowing as a result. and in the space between SPRING and "EW, look at all that dirty snow and melting guck!!!" To sign up for this Sess' that will AMAZE simply click on the Earth which will bring you to the sign in form that i request in order to help REPROGRAM your FREQUENCY~!!! LUV to LUV to LUV to know ya~!!! Check out her AWESOME POSSUM TESTIMONIAL TREE to learn what others have learned~! Now offering some SEASON OF LOVE discounts, deals, and Barter & Trade work off incentives. Click on the links in RED to learn more about EACH edifice opportunity for WELLNESS & Healing sessions for you to be enjoying and getting involved with TODAY~!!!! 2> TCM & Metaphysical Sciences Case studies OPEN CALL~! or.... check out our awesome possum workshops below in the pic. Here is a list of the modalities that are included and covered by Metaphysics; click on this link to bring you there. 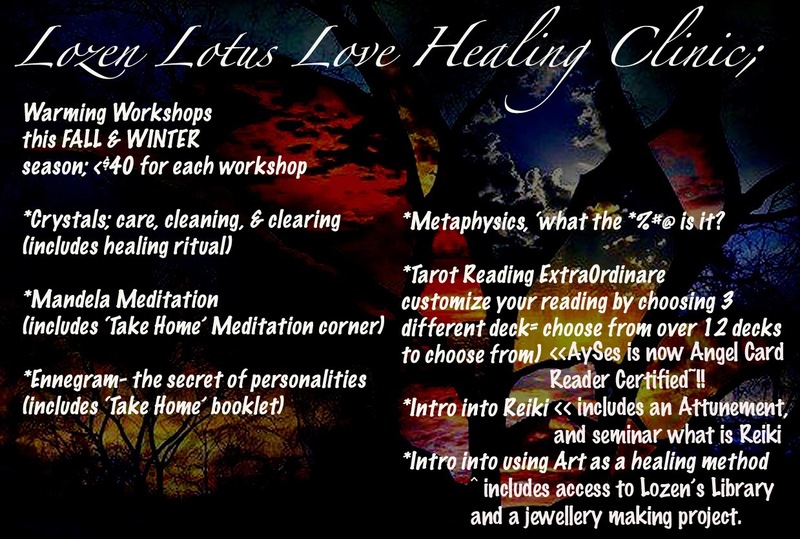 Welcome to Lozen Lotus Love's upgrades~! 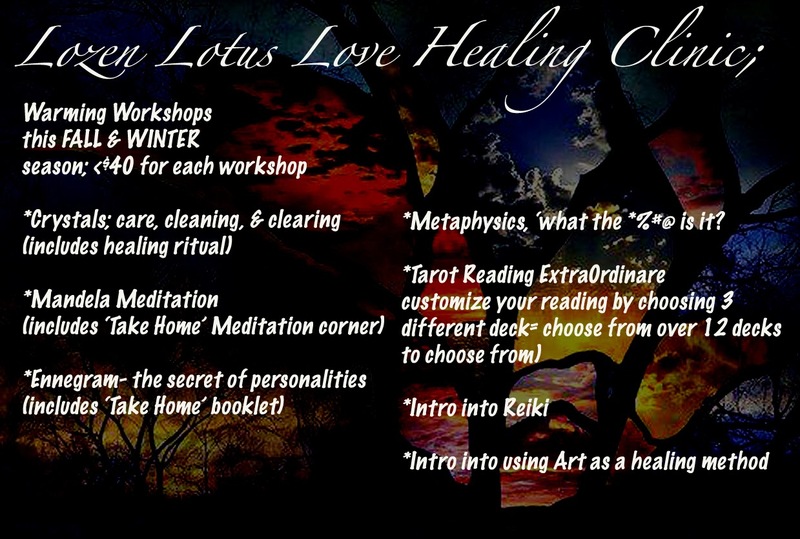 Here at Lozen Lotus Love we are upgrading and exploring new ways to help you enjoy your time with us even better. With our present focus on the 5 Elements of Traditional Chinese Medicine, and our continued love for the 7 Chakras we bring you enhancements that will alter your frame and have you walking away feeling RIGHT AS RAIN~! as at the bottom of this page. Enjoy~! our customised HEAL~YOU 1-0-1 plans. 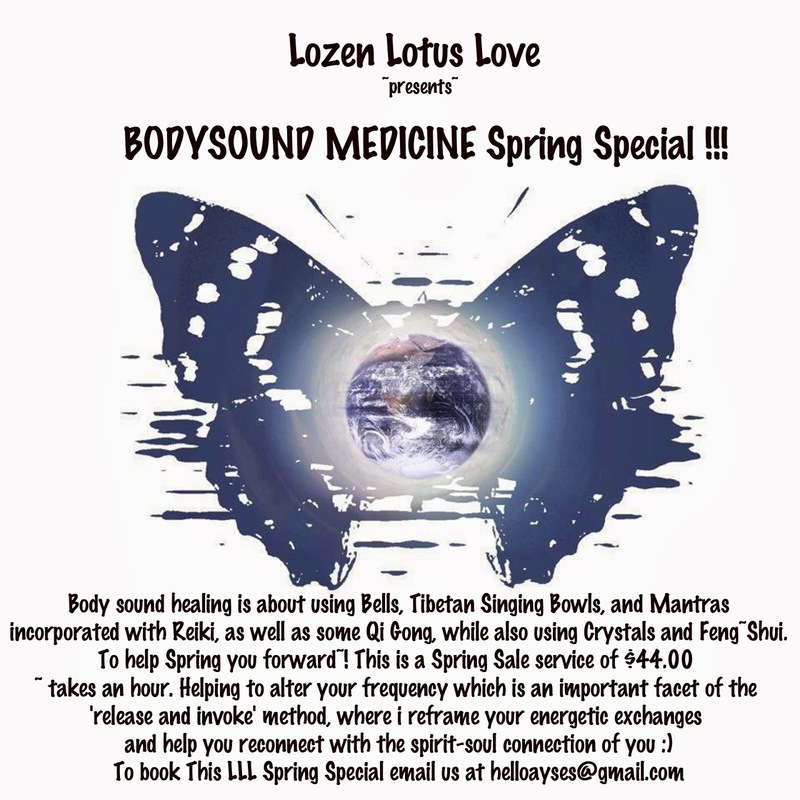 The clinic is named Lozen Lotus Love... the first name of this practice is given to Lozen, who was an amazing Native woman. She took care to her ppl with fierce loyalty and love. She was amazing with animals and could hear enemies approaching waaaayyyy before they arrived. Her protective and healing skills were only out matched by her heart for her land and her ppl. The second name is the Lotus which is a most precious beautiful flower that grows and is dependent on the crapshoot at the bottom of the pond to thrive(aren't we all...). & lastly= LOVE sweet love is what it is all about. Booking package DEALS will get your AMAZING DISCOUNTS! just finishing as well our 5 Elements special~ buy all 5 treatments, one for each Element and receive one for free!! Private Consultation available for a variety of Services; $25/hr. To add volume to your Metaphysical healing sessions here at LLL we have invested in 3 systems that will enhance your perception, your sense of well~being, and your over all state of relaxation..
choose from at $5 each added option~! 1st to introduce CHAKRA TEA. Tea made especially for each of the 7 Chakras. 2nd we have an amazing and special line of Essence. Have you heard of Bach Flower Remedies? In TCM (Traditional Chinese Medicine) There is a HUGE part of clinical work done to help each of the 5 Elements, as well as understanding and helping the levels of Yin Yang in our lives. This 3rd addition to our clinic is unique and divine. Introducing our 5 Elements Essential Oils. 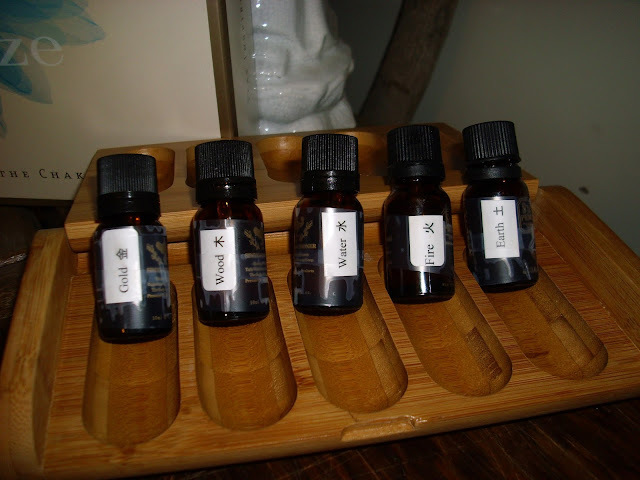 The Aromatherapy we induce into the room is by way of water vapor/mist. a Spa system device that soothes the soul while helping you fall into a deep healing meditative center peace of mind. is for those who want an Earthy, homemade specialty care for their skin. This AMAZING FACIAL SOAP is made with only the BEST QUALITY for your skin, including EXTRA VIRGIN OLIVE OIL that leaves your skin after cleansing soft and perfectly moisturized. Perhaps you want a Tarot Reading? AySes is a CERTIFIED ANGEL CARD READER and has over 16+ decks, including 4 Doreen Virtue Oracle & tarot cards and other forms of DIVINATION ready to help serve you as well such as Runes, and Native stone ppl. Whether you want a straight 1 deck reading or a DELUXE SPECIAL of 3 or more DECKS in 1 DETAILED READING that can include a vocal MP3 for your own future reference. here is a LINK to some of our seasoned decks that we LOVE as well as ONLINE READING PRICES AND LINKS. all reading presently include a digital copy of your cards as well as for online readings a WEBCAM session. If you take a closer look at our Tarot Table you will note the CAST IRON CAULDRON. It is our center of joy in that we were gifted it after soul searching for over 10 years. This BEAUTIOUS BELLE is resonating an amazing vibration in the space with its vintage being over 100 years old. It was found in the roots of an old HEMLOCK tree, deep in a forest...oh the magik that the Great Mother Weaves. BLESSED BE. Would you like to VISIT? Booking is super easy~! important to note; often either busy helping a visitor or working, so please LEAVE A FULL CONTACT & MSG for a faster response time. As well as specifics you are inquiring about. We would like to treat every frame with LUV LUV LUV. any unruly behavior will be politely shown the door. as well as the MOST IMPORTANT TO SOW. so be AWARE enough to CARE~! To learn more about our 5 Elements Treatments, OUR REIKI SPECIAL, or our many other services please continue to scroll down. BLESS UP my KINDRED~!